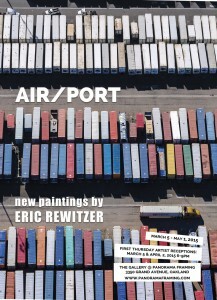 Air/Port: New paintings by Eric Rewitzer - Panorama Framing, Inc. Soaring amid container ships and clouds, artist Eric Rewitzer of 3Fish Studios and photographer Blake Marvin took to the sky over Oakland’s Port in late January. Their mission: to explore aesthetics of post-Panamax proportions. “From the air the shipping containers panned out in a color field over the horizon”, said Rewitzer. “And our subject matter was composed entirely by crane operators and longshoremen.“ Air/Port signifies a curious crossover between architectural photography and painting – documenting a place so few appreciate – and making it feel like home. After taking flight, Rewitzer’s journey led him to take residency in Jack London Square. 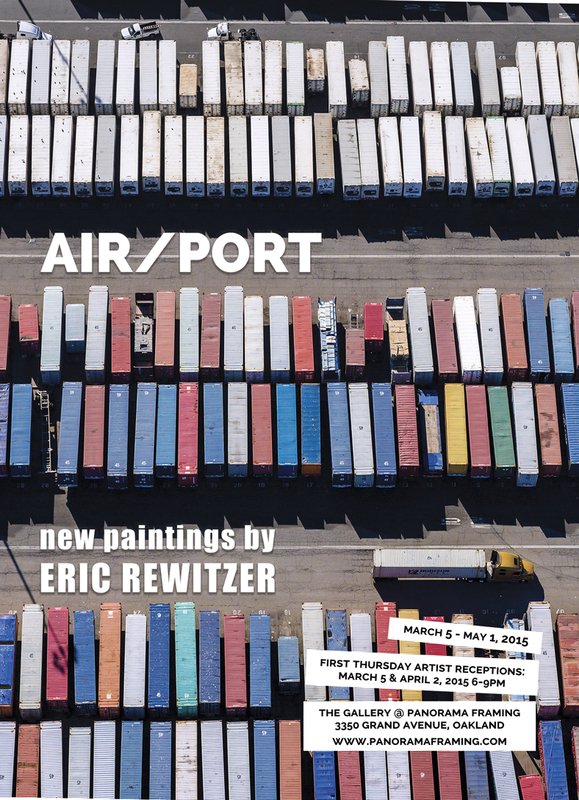 With inspiration from the 36 iconic cranes at the Port of Oakland and Marvin’s photos, Air/Port opens March 5th in the Gallery @ Panorama Framing.